BC EduThe ad as it appeared in a 2006 issue of The New Republic. A classified ad offering a job in the New York publishing industry has been posted, and reposted, with almost no changes for more than 10 years. 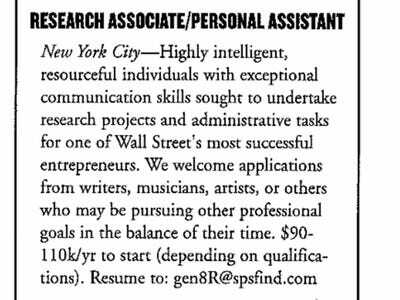 The curious job offer advertises a PA/research associate for “a busy executive” in New York City, with no further information about the employer. The salary is described as between $US90,000 and $US110,000 per year — generous, for the role. Highly intelligent, resourceful individuals with exceptional communication skills sought to undertake special research projects and various administrative tasks on behalf of a busy executive. We would welcome applications from writers, musicians, artists, or other candidates who may be pursuing other professional goals in the balance of their time. We offer a casual atmosphere in a beautiful space, working as part of an extraordinary group of gifted, interesting individuals. It sounds interesting doesn’t it? Beautiful space, extraordinary group of gifted individuals, with a potential $US100,000 salary. Ain’t bad at all. Although, it is quite old. The blog Working With Words has tracked the ad since the very beginning, when it appeared in a issue of The New Republic in the summer of 2004. The ad seems to have been posted and reposted for a decade now, only with a different email address and other minor changes every now and then. Back in 2004 you had to email [email protected] for the amazing job. The same address, with a minor variation, was still the recipient in 2006, when the ad was running on page 25 of The New Republic January issue. A journalist-mum on Huffington Post tried to have her daughter recruited in 2006, only to receive no answer. She saw the same ad in the February issue of 2009. By that time the ad had also moved online, and in 2008 it was seen on Craisglist, according to a comment on Working With Words. It had also added “medical researcher” among the tasks. Nobody really knows when the ad originally first ran. John Ettorre, a writer from Ohio who is behind Working With Words, wrote: “we’ve just been tracking it here for nine years, but I believe the ad began running several years before that.” That was in 2013. So someone has been running this same mysterious classified ad for 10 straight years now. A Business Insider UK staffer has applied to the ad on Monster. 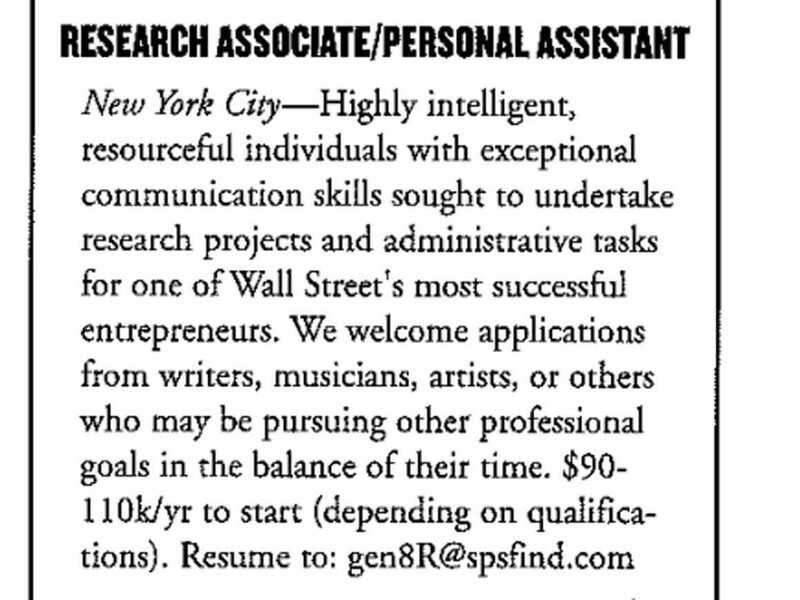 Scores of “writers, musicians, artists, or others” probably have too. You can do it as well! We’ve received no answer so far, but we will keep you informed when hear back.